Provide comfort for the family of Stephen Lee Bex with a meaningful gesture of sympathy. 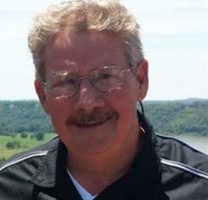 Stephen Lee Bex, 66, of Bloomington, passed away unexpectedly on Friday March 29, 2019 at his residence. Stephen was born January 24, 1953 in Bloomington, IN and was the son of the late Hubert and Margaret (Porter) Bex. Stephen retired almost a year ago from Curry Auto Center where he had worked 14 years in the Body Shop. He had previously worked for Mitch's Body Shop and Wilbur's Body Shop. Stephen enjoyed archery, loved to hunt and cook and enjoyed riding motorcycles and working on cars. Stephen is survived by his wife, Janet (Janson) Bex; son, Steven Bex; 2 grandchildren, Chyote Bex and Shamen Bex; 3 great grandsons, Tommy Bex, Hunter Erdmann, and Elias Erdmann; 2 sisters, Bobbie Jo Bex and Vonda Ryan; mother-in-law Eleanor Janson; sister-in-law, Jennifer Janson-Rizzo; brothers-in-law Jeff and Joseph Janson; nephew, Nolin Rizzo; niece, Lane Bennett; and great niece, Lyric. Stephen was preceded in death by his parents and grandparents; daughter-in-law, Jennifer Bex; and brother-in-law, Joe Ryan. Visitation for Stephen will be on Thursday, April 4, 2019 from 4-8 pm at The Funeral Chapel of Powell and Deckard, 3000 E. Third St. Bloomington and on Friday, April 5, 2019 from 10:00 am until service time. Services will be 11:00 am Friday, April 5, 2019 at The Funeral Chapel with Pastor Les Rovenstine officiating. Burial will follow at Clear Creek Cemetery. We encourage you to share your most beloved memories of Stephen Lee here, so that the family and other loved ones can always see it. You can upload cherished photographs, or share your favorite stories, and can even comment on those shared by others. Vonda, Sorry to see the passing of your loved one. You and the family is in our thoughts and prayers. Janet I'm so sorry to hear this. My thoughts and prayers are with you. I'm so very sorry for your loss Janet! I can't imagine what you are going through. Prayer for you and family! Janet I'm so sorry for your loss. You and your family will be in my prayers.